Practically the first card trick every magician learns, the peek a boo find lets the magician find the spectator’s card every time. 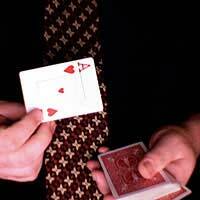 After spreading the cards, the magician asks the spectator to make a choice and pull it out of the deck. Once memorised, the card is put back into the deck. With a minimum of fuss the magician thumbs through the deck and retrieves the chosen card. The secret is the “peek a boo”, or just the peek, where the magician looks not at the chosen card but a key card he then uses to find the chosen card. Just a normal deck of playing cards. While it can be used as a magic trick all by itself, the Peek a Boo Find typically requires some embellishment to keep the audience interested. As a tool for finding a card, the Peek a Boo Find is used in hundreds of card tricks, many of which are simple variants of this one. The cards should be cut about halfway down, and as the magician says “place your card here” he should get a look at the bottom card of the top half of the deck. This will be the “key card” that he should remember. Now the magician needs an excuse to look through the cards in order to locate the key card. This can be done by simply stating that he will now find the chosen card. Some variants on this theme are discussed below. Once the magician spots the key card a quick glance to the left will show him the chosen card. The simplest thing to do at this point is pull the card out of the deck and say “Your card is the” and name the card as you show it. The magician can explain that he can pick up on the psychic fingerprint left behind by the spectator, and thus scans all the cards to find it. The magician can claim an extraordinary sense of smell, smell the spectator’s fingers and then scan the cards, pausing to smell them at intervals, and then find the card by smell. The magician can claim he can find the card in three guesses, and pick out three cards. Then he visibly discards the wrong two and says he found the card. The magician can take the chosen card out and put it face down and say “I know it’s NOT that one,” and then start to pull out wrong card after wrong card before revealing that he picked the right card the first time. As can be seen by the variants, the possibilities are endless. The magician just needs to make sure the use of the key card is done as subtly as possible.